This is an application example of totalcensus package. The geographic hierarchy primer in Census 2010 summary file 1 technical documentation displays the relationship between geographic entities. The lower one of the two entities connected by a line is entirely within the boundary of the upper one. For example, a county subdivision is always within the boundaries of a county and a school district always within the boundaries of a state. If two entities are not connected, they may not belong to each other. For example, the ZIP code tabulation areas may cross state borders though they are much smaller than states. If two geographic entities are not connected by a line, how do we know, for example, how many ZIP code tabulation areas are in or partially in Boston city? 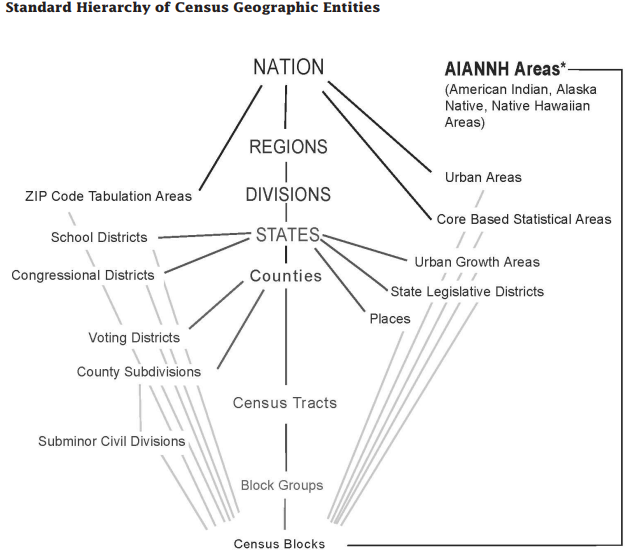 The key to answer this question is that census blocks are connected to and lower than all other geographies. We can connect any two geographic entities through census blocks: if an ZIP code tabulation area and Boston city share a census block, the ZIP code is in or partially in the city. The decennial census 2010 has data down to block level, with which we can find all zip codes in Boston using totalcensus package. # use search_fips("boston", "MA") to find its PLACE code is "07000"
#   "02134" "02135" "02467" "02215" "02163" "02115" "02116" "02199"
#   "02108" "02114" "02113" "02109" "02110" "02203" "02129" "02128"
#  "02127" "02210" "02118" "02111" "02119" "02120" "02130" "02121"
#  "02125" "02122" "02124" "02126" "02131" "02132" "02136" "99999"
Now let’s read race population by zip code in or partially in Boston city from the latest 2016 ACS 5-year survey. Let’s examine another example: congressional districts (CD for 111th congress) and state legislative districts (SLDU for Upper Chamber year 1 and SLDL for Lower Chamber year 1). Both CD and SLDs descend from states but do not belong to each other. Usually SLDs are smaller than CD. So which SLDs are in or partially in each CD? Again, we can connect CD and SLD with census blocks using decennial census 2010 data.